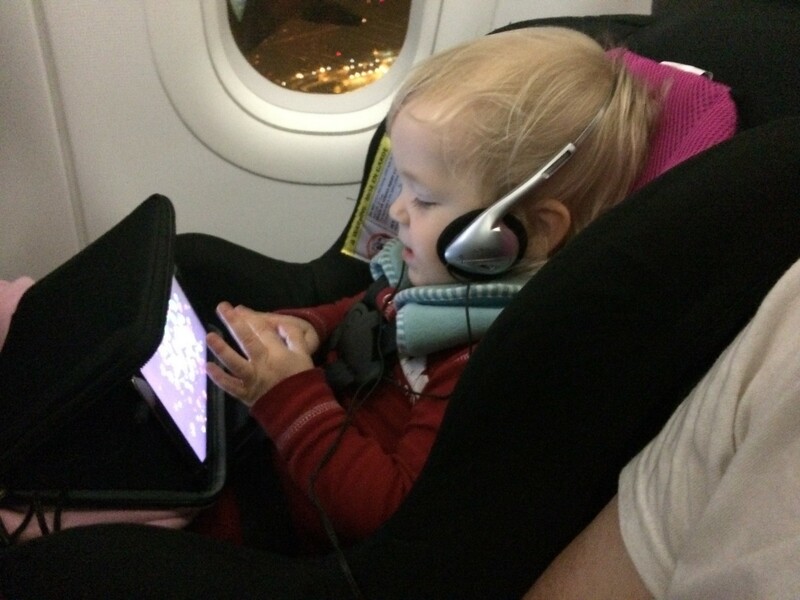 When we were planning our first long-flight airplane trip with our toddler, we were quickly confused. How do you choose a travel car seat for air travel? What size are the seats on an airplane? 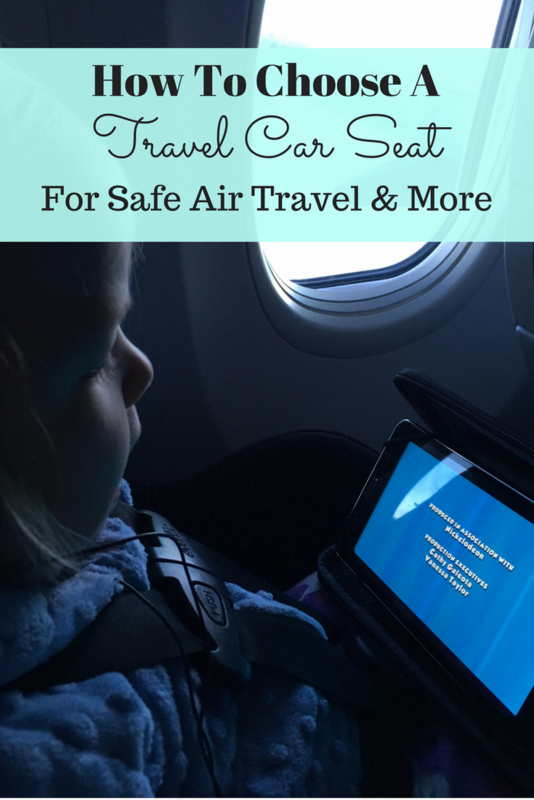 What are the rules and regulations about safety car seats for kids on planes? What we wanted was to find a car seat that we could purchase specifically for travel with our growing toddler. It needed to be small enough to fit on the airplane seats, light enough to carry around in the airports and on our journey, have the proper safety ratings to be allowed on the plane, and comfortable enough to keep my toddler (and now preschooler) in her seat for play and sleep. FYI: To support my recommendations, I have included affiliate links to products within this article. Further information at the bottom of this post. We debated back and forth about what to do. Our regular at-home child’s car seat was purchased for it’s quality and comfort, but it was far too large and heavy to come with us. One option we found was purchasing a CARES harness, which is a buckle attachment system to turn the airplane seat’s seat belt into a 5-point safety harness. While this might be something we invest in in the future, I felt that my small toddler would have a hard time getting comfortable and supported enough on all sides to fall asleep and stay asleep. Being that our travels tend to be lengthy (like the over 24-hour trip to Colombia we were looking to equip ourselves for), we needed to be sure that the comfort level of our child’s seat was conducive to sleep. I could definitely see how a CARES harness could be useful if you needed to pack light, or for an older child, but for us, that wasn’t the option we wanted. Having a travel car seat on the planes with us has been well worth it when we’ve been held up at airports and our toddler needed a nap. Lifesaver! So we passed on the CARES harness in favour of finding a child’s car seat that would fit on the plane, but that wouldn’t break the bank. This decision would also mean that we would have a travel car seat to hook into the various cars and taxis that we would be taking over the course of our 3-week excursion around Colombia (as well as future trips). I have to admit, it’s actually been handy to have a second car seat back at home, too, for childcare situations, fitting into her dad’s truck when need be (it’s lacking on space), or for when there’s a toileting accident or puking incident that puts our regular seat out of commission. It was surprisingly difficult to find out the actual size of an airline seat. Being that airplanes come with different seat sizing, we chose to call our airline and ensure that we had the seat size correct. The measurement that they gave us for the smallest seats we’d be encountering during our multiple flights was 17″ width. I’ve since found this super handy chart of information about sizing (and other info) for airplane seats on different airlines. After much looking around online and in person, at a bunch of different car seats, we finally found the perfect travel car seat for airplane travel with our toddler. The Evenflo Tribute LX Convertible Car Seat. If you click on that Amazon affiliate link, you’ll notice that the price is actually a lot heftier than the somewhere-around $100 we spent on ours at Walmart. I looked around and around to find it, but for some reason Walmart isn’t carrying it any longer. However, it is available at Best Buy, and for a reasonable price. You can get free shipping on orders over $35 by clicking on the ad below. There is also another Evenflo car seat that seems to be an alternative to the Tribute, called the SureRide. It seems to be a great option for a small and lightweight travel car seat, just like the Tribute. It sure has been handy to have the lightweight travel car seat for traveling around with our little one, not only on the plane, but once we get where we’re going, too. We love the Evenflo seats. Our regular at-home car seat is an Evenflo Symphony and it’s AMAZING! The latch system makes it super simple to put in and out for quick transfers, and it’s pretty serious in terms of safety and comfort. Plus it’s a 3-in-1, so it grows with our little one. Yep, she’s a happy camper in her big, safe car seat! Good luck on your family travel adventures! I hope what I’ve shared with you here about our experience choosing a travel car seat has been useful. Making sure our adventures go as smoothly as possible is important to me, and I’m sure you’d like yours to be easier, too. Looking for more tips on family travel with toddlers and preschoolers? Read this post with tips for air travel with kids, and also make sure to check out my suggestions for travel activities for young kids. If you like what you found here, why not sign up here for a short and sweet weekly email that lets you know what’s new on The Big To-Do List? You can also connect with me on social media. You can find me on Facebook, Twitter, Instagram, Pinterest, and even YouTube. Disclosure: This website uses affiliate advertising and affiliate links, which provide me with compensation when a sale is made through any of these links. Thank you for supporting my blog if you do choose to check out my recommendations and purchase through these links. You can view my full disclosure statement here.